England had a nervy opening 20 minutes to their last game against Slovenia. Do that against Germany and the game could be out of sight. England must start with purpose and a high-tempo. This is how England play at their best. And only England's best will do if they are to get the victory. Most sporting cliches irritate me. But the one that states that if you control the midfield, you control the pattern of the match is not one of them. It's so true that it always bears repeating. Injury had shorn Germany of some of their best midfielders before the competition, but the men who have come in as cover have done brilliantly. Bastian Schweinsteiger has knitted Germany's play together superbly in the absence of Michael Ballack. Sami Khedira has been a tireless presence, often popping up in the penalty area to supplement Germany's attacks. And then there is Mesut Ozil. Ozil is a gem of a player, one of those guys who give credence to the viewpoint that football is indeed 'the beautiful game'. As for England, Frank Lampard has stuttered so far. It's also been a mixed bag from Gareth Barry. Steven Gerrard has shown something approaching his best form, especially against Slovenia. The individual battles will be pivotal. Barry will have his hands full with Ozil. Lampard must win his engine room confrontation against Khedira. This will allow Gerrard the freedom to force Schweinsteiger to operate deeper than he is comfortable with. It may aso be an idea for Fabio Capello to tell James Milner to tuck in when Germany have the ball to give England more defensive security. Whatever tactics Capello chooses, what is certain is that if England aren't superior in midfield, they will lose. This is linked to both earlier points. One thing that Capello has insisted on from his players is that they pressure the opposition with a relentless zeal. When they played Australia, Germany showed that if you give them time on the ball, they will pass it around you and leave you seeing nothing but the backs of their shirts. England must not allow this to happen. Germany are not amongst the World Cup's quicker nations so England must press high up the pitch, and press from the front. So even Jermain Defoe (who is expected to keep his place) has to run himself into the ground to keep the pressure off his defenders. If England don't leave every ounce of physical effort on the pitch then they will be eliminated. Many England fans have approached with game with a great sense of foreboding. And for good reason. 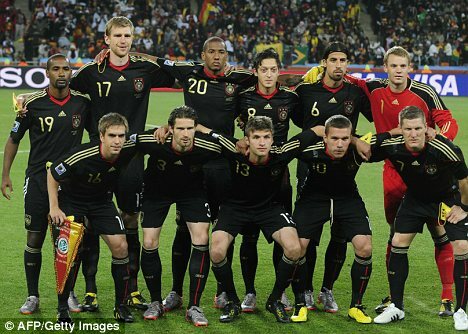 As I've said, Germany are favourites. It would be foolish to think otherwise. But the good thing is that what we think has no impact (No, really. Shout and cheer as much as you want. The players can't actually hear you). The players and coaching staff must believe without hesitation that they will win tomorrow. This is the stage of the World Cup where deference will be punished without mercy. For an example of this, watch Lee Dong-Gook's miss in the closing stages of the South Korea/Uruguay match. When the moment came, Lee's mentality failed him. England must not replicate this. Otherwise... well I think I've made my point.